Use them up to 15 times! Most Asians aren't blessed in the lash department. But because of falsies, our peepers can now look glamorous whenever and wherever we want! The problem, though, is they're expensive, and if we wore them every day, we'd have to keep buying them. Before you start ripping the glue from your false eyelashes, make sure you have these producs on hand first: micellar water, cotton pads, a pair of tweezers, and cotton buds. Got 'em? Then read on. Hold the lashes by the base, and using your tweezers, gently tug at the leftover glue to remove it. You can use your fingers to remove the rest of the glue, but the main thing is that you do it delicately. 2. Place the lash between two cotton pads soaked in oil-free makeup remover. To remove most of the mascara from the lashes, put it in between the soaked cotton pads, lightly press down, and wait for ~30 seconds~ before removing them. 3. Carefully wipe away any remaining mascara with a cotton bud soaked in makeup remover. But of course, your falsies will still have a bit of mascara remaining. To get rid of it, place the falsies on a clean cotton pad, and using a makeup remover-soaked cotton bud, gently wipe away. Use the other (clean) end of the cotton bud to remove excess mascara residue. 4. Place the lashes back in your lash box. 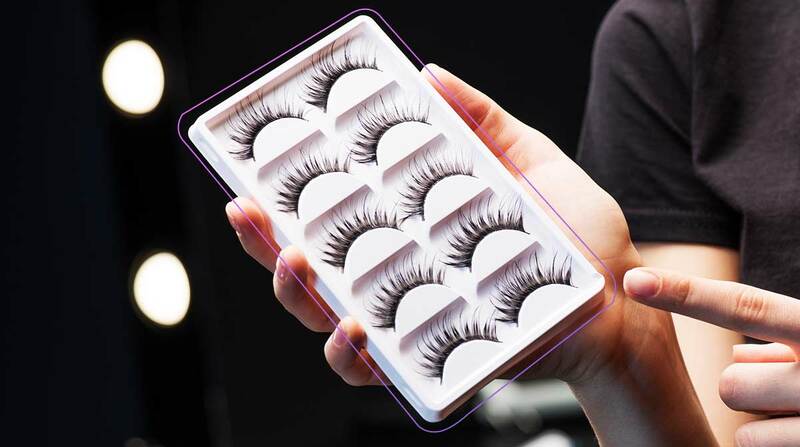 If you want to keep the lashes curled and in good shape, place them back in their original box and secure the lash band firmly against the mold. That's it! Watch these steps in action below!